The State Opening of Parliament is one of the most formal and ceremonial items on the Queen's agenda for the year. It's an event filled with history - nearly everything about it is symbolic in some way. She opens a new session of Parliament by traveling to the Palace of Westminster (home of Parliament) and reading a speech outlining the government's agenda for the new session. The speech is written for her by the government. The State Opening usually happens once a year, though there are exceptions (including 1974, when there were two - one of which was a "dressed down" version - and 2011, when no State Opening fell during the year). It has often occurred at the end of the year (November, December), but starting in 2012 it falls in May. The Queen has missed only two of these ceremonies, in 1959 while expecting Prince Andrew and 1963 while expecting Prince Edward. When it comes to jewels, the State Opening offers us a chance to see some things we don't see at any other events. 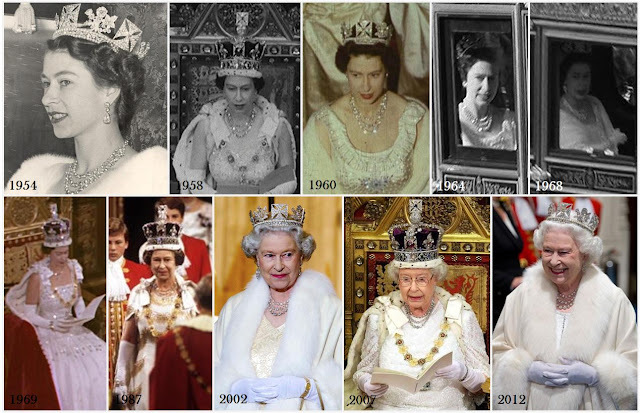 The Queen always departs Buckingham Palace wearing the George IV State Diadem, the only time she uses it apart from selected portrait sittings. When she arrives at the Palace of Westminster, she changes into her parliamentary robe and the Imperial State Crown, which has previously been retrieved from its home with the rest of the Crown Jewels at the Tower of London and has traveled to Parliament in a coach ahead of the Queen. This is the only time, apart from the coronation, when the crown is used. Prior to departure, she will change back into the George IV State Diadem. (In 1952, before her crowning, she simply kept the state diadem on for the ceremony.) This is also one of the only times we get to see her wear the Collar and Great George of the Order of the Garter, which is draped over her shoulders. The Queen wears a dress in white or gold and selects a necklace, earrings, bracelet, and evening watch to go with. These are usually pearl and diamond, but there are years where colored jewels have made the cut. 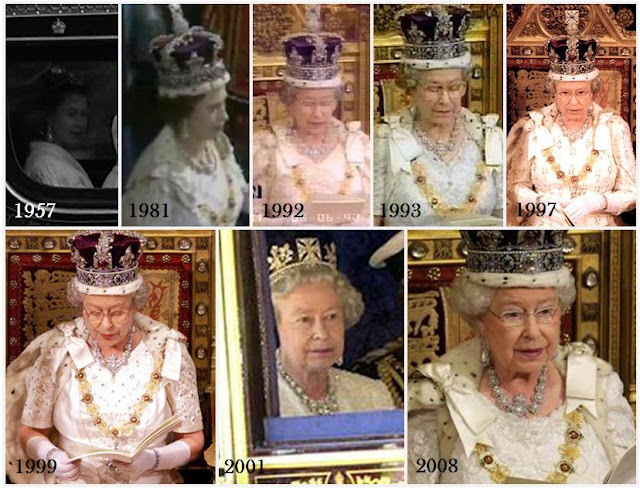 Thanks to this preference for white, the Queen's appearance can look near identical from one year to the next, and getting the year accurate can be a trial (you'll have to forgive any mistakes here). 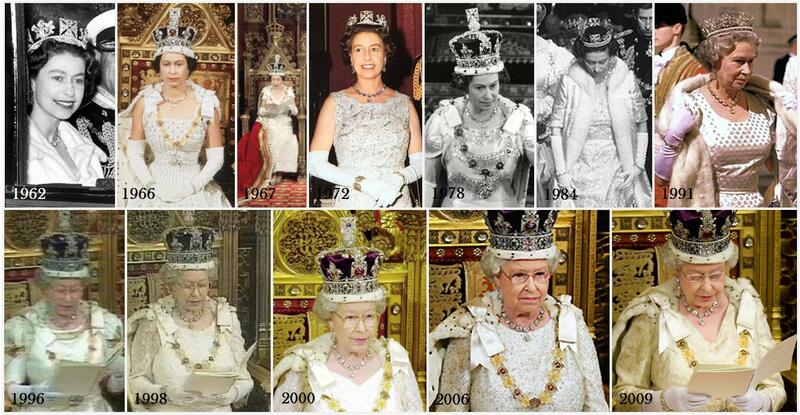 This flashback of selected State Opening appearances will focus on the necklaces and earrings. The wrist elements are harder to identify, particularly from past years; Queen Mary's Chain-Link Bracelets, the Wedding Gift Bracelet, and Queen Victoria's Bracelet are popular, as are various pieces from her collection of diamond evening watches, including her current favorite. 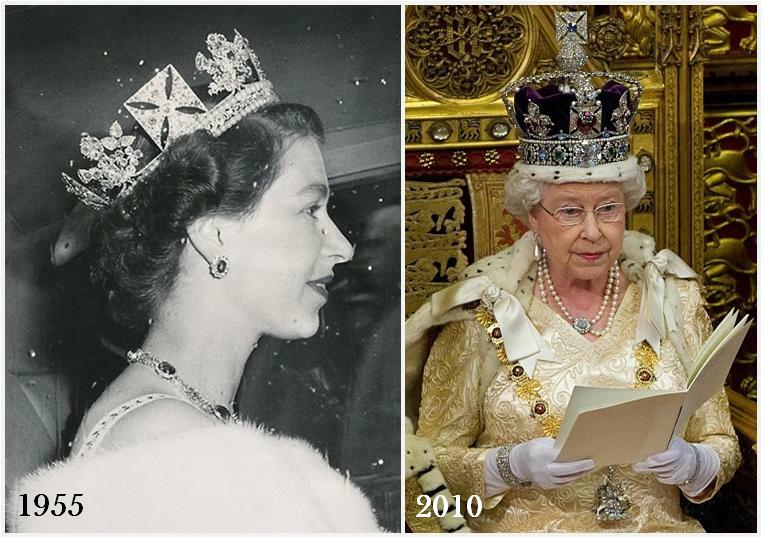 As her favorite pearl and diamond necklace, it's no surprise that the Jubilee Necklace is perhaps the most often worn item for the State Opening. It was her pick for her first year as Queen, in 1952, paired with the pearl drop earrings. The necklace has been particularly popular in her later years. Her pairing with the Gloucester Pendant Earrings is so much a favorite, it's practically a parure of its own. She has, however, used the smaller pearl earrings from Queen Alexandra on a few occasions, which is not a pairing we see as often. The Coronation Necklace is a popular choice with the Queen at any formal occasion, obviously including this most formal of events. The necklace is usually paired with the matching earrings, and such is the case here. 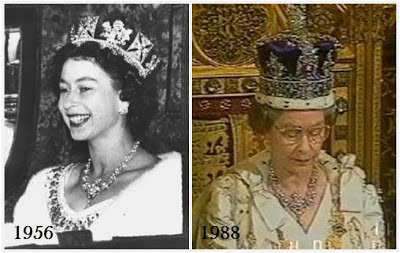 It's unusual to see the Coronation Earrings paired with something besides the Coronation Necklace, but they've been paired with the Festoon Necklace here (1954, 1969). Other earring matches include the Antique Girandole Earrings (1968, 2002), Queen Mary's Floret Earrings (2007), and the Diamond Pendant Earrings (2012). When a colored stone is selected, it's usually rubies, which pick up on the red of the robe and the Black Prince's Ruby (which is actually a spinel) at the front of the crown. The Baring Ruby Necklace is the most popular choice, usually paired with Queen Mary's Ruby Cluster Earrings. Other ruby choices less frequently worn include the Ruby Swag Necklace and matching earrings (feature to come), and the large Ruby and Diamond Floral Bandeau Necklace, which was even paired with the Coronation Earrings in 1965. Emeralds have been chosen for the State Opening at least once, in 1955, when the Queen wore the Delhi Durbar Earrings and the Delhi Durbar Necklace. And 2010 brought a surprise in a primarily pearl necklace, a double strand necklace which may be the Hanover pearls, very old indeed. Many parts of the State Opening of Parliament are precisely the same today as they were when the Queen started her reign, and for many years before that. But one thing that has changed is the number of members of the royal family in attendance alongside the Queen and the Duke of Edinburgh. The ceremony used to be attended by a large royal contingent including Princess Margaret, the Gloucesters, Kents, and so on, but royal attendance has been largely cut back. The late Princess of Wales' attendance at the ceremony revealed a few other pieces from the Queen's jewelry collection: the Cambridge Lover's Knot Tiara, in 1981 and 1991, and the King Khalid Diamond Necklace in 1982. When Princess Anne attended as a young princess, she did so on occasion in the Halo Scroll Tiara.